​I remember how good I felt when I first learnt how to knit. I had learnt all the stitches, they were looking neat, and I was only dropping the occasional stitch. I was anxious to start on my first proper knitting project. I also remember the feeling I had when I picked up my first knitting pattern. It contained so many codes and technical terms that it seemed to be written in a foreign language! Fortunately, I had access to more experienced knitters to help decipher the pattern, but what I really could have used was a cheat sheet to help me through. That is why I have decided to create a cheat sheet of my own for new knitters, to help beginners read knitting patterns and get started on their first projects. Before you even start knitting, there is the challenge of picking an appropriate pattern and deciphering the information on the packaging to find the one that is right for you. So what are the main things to look at when selecting a pattern? This is usually printed pretty clearly on any pattern you pick up. Apparently, if you are starting to go for one labeled as a beginner’s pattern, and leave the intermediate and advanced for further down the line. Some companies use a scale from 1-4 to indicate difficulty, with one being the easiest. Again, start there and see how it goes. With beginner’s patterns, size isn’t likely to be very important as you will probably be knitting scarves, blankets or other items that don’t require fitting. When you advance to more complex projects like jumpers where fit matters, the pattern will come with a size guide. A single pattern will usually come with a variety of sizes, with different instructions depending on the size that you want. Make sure you look at the measurements on the pattern to check that it has a size that is going to fit the intended recipient of the item properly. The type of yarn that you’ll need to use to complete the project, as well as the amount will be given in the pattern information. This will also tell you what size needles to use and list any other special tools that might be required. It is not always necessary to use the exact yarn recommended by the pattern, and experienced knitters are good at knowing what yarn is likely to work for what type of project. When you are just starting, pick a yarn that is a similar weight and thickness to what the pattern recommends. The gauge indicates how tight your stitches should be when completing the project. It will usually say something like ten rows of 6 stitches on size 13 needles should equal to 4 inches. This implies that when you are knitting the project, ten rows of 6 stitches should make a 4-inch square. It is advisable to try knitting a small block like this before you start a project to see if you are hitting the gauge, or if your stitches are too tight or too loose. If you are consistently missing the gauge because of your knitting style, you might need to try different needles. So that is just the information on the pattern packaging that you need to consider when picking your pattern and selecting your needles, yarn and other tools. When you open your pattern, you will find that it is full of abbreviations that are extremely helpful for experienced knitters, but rather confusing for beginners. 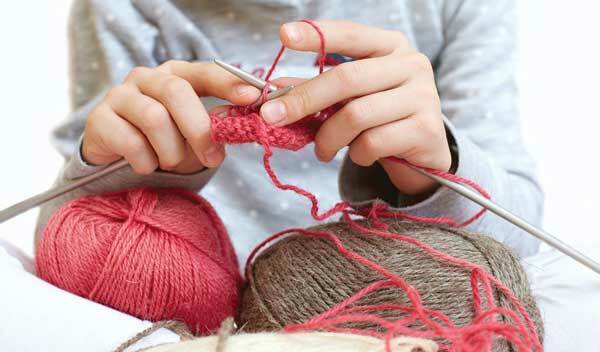 CO – Cast On: This is when you cast your yarn on your needles at the start of your project. K – Knit: This is the basic, most common knitting stitch. P – Purl: This is the second most common knitting stitch. Many basic patterns use an alternating row of Knit and Purl as their foundation. Other patterns may call for alternating Knit and Purl stitches in the same row. RS – Right Side: This means the front of the project. Most projects have a clear front and back, though of course there are also reversible projects. WS – Wrong Side: If there is a right side, then there is a wrong side too, so the back of the project. Inc – Increase: This is an instruction to add a stitch to your row. The most basic way to do this is to complete a new stitch in both the front and back of an existing stitch so that you transfer two stitches to the other needle rather than just one. Both increasing and decreasing (see below) can be done in both knit and purl. Dec – Decrease: This is an instruction to eliminate stitches to reduce the width of the project. The surest and easiest way to go about this is to work two stitches together, moving one stitch over to the new needle in place of two. Most patterns will have a specific way of increasing and decreasing in mind for the particular project and will include information about this in the instructions. Rep – Repeat: This appears when you need to do the same thing again sometimes. Sl – Slip: This means to slip, or transfer a stitch from one needle to the other without working the stitch. BO – Binding Off: You will see this when you come to the end of the project and need to take the project off your needles without unraveling the yarn. This is also sometimes referred to as Casting Off. Now that you know how to read a pattern, you can get knitting! When you are just starting, you will probably encounter quite a few frustrations along the way such as dropped stitches and mistake rows that need to be unraveled. The thing to remember is that your first project doesn’t need to be perfect, but it should be fun and that every experienced knitter had to start somewhere.